Background: When Natalie was 6 years old she was trapped in a house fire. She was rescued by the emergency services and escaped with minor burns and suffering from smoke inhalation. the physical scars healed over the next few months but the mental and emotional scars remain. Large fires or thick smoke take her back to that scared little 6 year old. The rest of Natalie’s early life was as quiet and normal as any other. She did well in school and graduated from college in the top 30% of her class. On leaving college Natalie joined the US Coastguard and has participated in a number of daring rescues and very successful anti-smuggling operations. Oh dear, don't give it up for the ghost. Plug on! Modus Operandi is more than a fan site. Modus Operandi is THE unofficial source for espionage roleplaying games on the internet since 1999. It acts as a central intelligence hub providing adventures, rules, character sheets, reviews, and fan fiction. 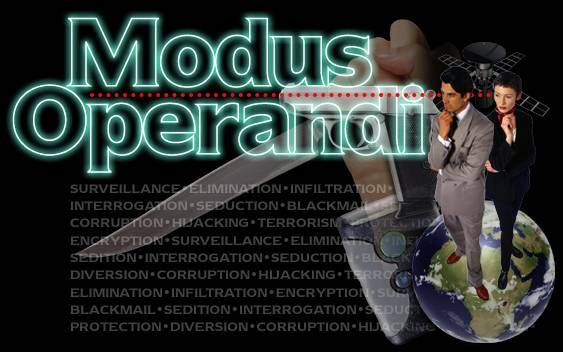 Founded on 16 May 1999, Modus Operandi is celebrating its 20th anniversary in 2019! Modus Operandi is a 5-time ENnie award nominee: 2004, 2005, 2006, 2007, and 2013. Modus Operandi © 1999—2019 Dave McAlister. Modus Operandi logos © 1999 Rob Silk.